Cartoons & Caricatures' Lee P. Sauer provided entertainment for the annual banquet of the Richland Township (DeKalb County, IN) 4H Club. 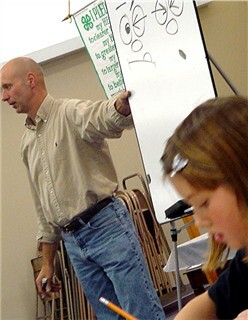 Sauer provided a short history of cartooning and then led the 4H'ers and their parents in a drawing session. 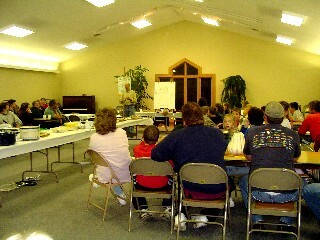 DRAWING INSPIRATION—The banquet was held in a reception room of the Cedar Lake Church of the Brethren. THE BOSS—Sauer draws a cartoon of William "Boss" Tweed, the New York political boss brought down by cartoonist Thomas Nast. 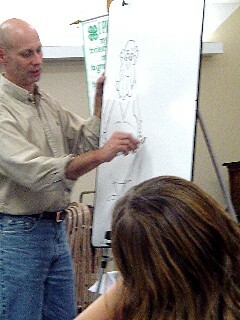 EXPRESSIVE LINES—As a young 4H'er follows along, Sauer demonstrates how to draw cartoon expressions.